ENDE, Indonesia - On Sunday, 25th October 2015, Bro. Yohanes Baptista Waja, SMM (Joan) together with four diocesan priestly candidates received their priestly ordination, presided by Mgr. Vinsentius Sensi Potokota, Bishop of the arch-diocese of Ende in Mukusaki Parish. Many priests and lay people participated in this solemn celebration. In his homily, Bishop Vinsentius reminded the priests that “all priests are called to be the sign of God’s presence and to be faithful. In the world marked by cheap freedom, egoism and individualism, it is not so easy to put into practice the priestly life. Therefore, as a priest we must entrust our life, our vocation and our work in God’s hand”. Bishop Vinsentius encouraged all who were present to continue supporting and praying for the newly ordained priests. A week later, on 31 October 2015, the newly ordained priest – Fr. 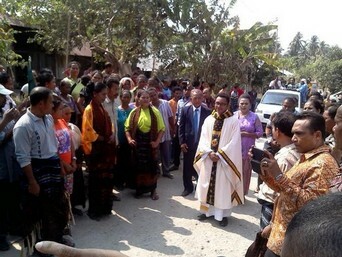 Yohanes Baptista Waja, SMM - presided the thanksgiving Mass in his village. It was indeed a blessing and a beautiful celebration. All people participated actively in the celebration, singing and dancing. They expressed their joy and their gratitude to have a newly ordained priest in their midst. We give thanks to the family which has offered Fr. Joan, the beautiful gift that they have to God through the Montfort Missionaries (SMM). After his priestly ordination, Fr. Joan was sent to the mission in Sintang diocese, West Borneo. Congratulations!